NetDimensions announces the opening of its Next Steps global user conference in London, United Kingdom on October 16th. NetDimensions (AIM: NETD; OTCQX: NETDY), a global provider of performance, knowledge, and learning management systems, announces the opening of its Next Steps global user conference in London, United Kingdom on October 16th. The event will bring together leaders and professionals from L&D, talent management, and HR, as well as industry analysts in an inspiring environment. This year’s event will feature Jeff Freyermuth, Principal Research Analyst at Gartner Research, as the keynote speaker. Mr. Freyermuth will share insights on the status of the learning and talent management software market and discuss the growing role that mobile, social, and analytics play in this increasingly global market. "We are very much looking forward to seeing our clients in London. This year marks NetDimensions’ 15-year anniversary and we are delighted to see that our global user conference is expanding, as we are once more experiencing record attendance,” said Alex Poulos, NetDimensions' Chief Marketing Officer. “This year we have built a very interactive agenda and we are happy to bring together an exciting lineup of client, partner, and industry analyst speakers. Our attendees will have the opportunity to meet our team and learn from product experts, as well as share their own ideas, experiences, and best practices." The first day of the global user conference will feature a full day of interactive sessions that will cover a variety of topics, including advanced compliance management, talent analytics, mobile learning, product innovations to respond to current and future business needs, as well as best-in-class compliance, compensation, and social partnerships. On the second day of the conference, attendees will have the opportunity to participate in different training tracks that will provide practical insights into the new capabilities of the NetDimensions Talent Suite. "We would like to give a special thank you to our Platinum sponsor, Cegos, our Gold sponsors, BIOVIA and Curo Compensation, our Silver sponsor Speexx, and our reception sponsor CWJ, for being with us this year. We are extremely pleased to see this level of involvement from our partners at Next Steps and beyond," added Poulos. 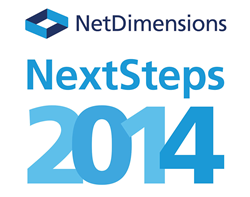 For more information about the Next Steps Global User Conference, visit http://www.netdimensions.com/events/next-steps-2014/london/index.php. NetDimensions provides companies, government agencies and other organisations with talent management solutions to personalise learning, share knowledge, enhance performance, foster collaboration and manage compliance programs for employees, customers, partners, and suppliers.